Unfortunately for today's Aida simulcast from the Metropolitan Opera, I have tucked away a VHS tape of the original broadcast of this production when it was new in 1988. In those days James Levine conducted everything that made it onto TV and Placido Domingo played all the tenor roles. 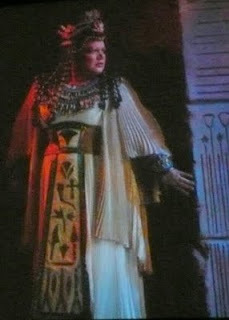 And in those days Dolora Zajick sang Amneris. Zajick's voice now shows more intensity throughout its range. It was a joy to hear her today. Johann Botha played it for beautiful legato while Placido was going for youthful enthusiasm. Contrary to popular trends, all the singers were thinner twenty years ago. They weren't afraid of black face in those days--Aprile Millo is quite dark. Violetta Urmana was as white as I am. I liked her very much as a soprano, more than I had as a mezzo. Her voice is completely rebalanced for this new Fach. I kept wishing they were broadcasting From the House of the Dead instead. Maybe I've done enough Aidas. 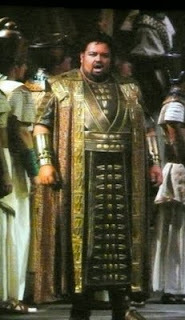 I thought all the voices were good except whoever it was who sang the role of the High Priest. He was wobbling all over the place and consistently dragged behind the orchestra.